Executives at service- oriented companies said the economy continued to run strong into October. The non-manufacturing index compiled by the Institute for Supply Management slipped to 60.3 last month from the 21 year high of 61.6 set in September. The reading in September, however, was the second highest n the history of the index that dates back to 1997. A reading of over 50% is viewed as a positive for the economy and anything over 55% is considered exceptional. Almost every service industry expanded in October; with the exception of education, the only one to show a decline. New orders were virtually unchanged, remaining at a very high level. Employment growth slacked a bit, although companies still continued to hire. The biggest complaints revolved around uncertainty caused by US tariffs, difficulty finding enough transportation to ship goods and other constraints on production. As this latest Ism survey shows, the US is still performing at a high level and a good holiday season this year is expected. “Business has been strong. Continuing momentum seen in past month. Anticipating continued strong sales through the remainder of the year,” predicted an professional executive. The number of job openings in the US fell in September just a month after setting an all time high. Companies, however, are still scrambling to find workers and offering higher pay and benefits to attract them. 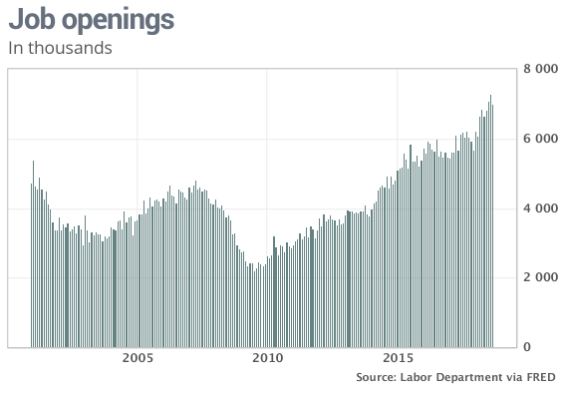 Job openings slipped to 7 million on the last day of September from a record 7.3 million in August. Despite the decline, job openings still exceed the 6.1 million Americans officially classified as unemployed. Job openings first surpassed this number of unemployment in early spring. The share of people who left jobs on their own, known as the quits rate was unchanged at 2.7% among private sector employees. This is the highest level during the current expansion and close to he record high of 2.69% set back in 2001. Workers quit their jobs more often when they feel secure enough in finding another; in a sign that the economy is strong. Typically, workers who move end up with better pay. About 5.7 million people were hired and 5.7 million lost their jobs in September. The strongest labor market in decades is powering the US economy and is likely to set a record for the longest expansion ever by next year. The unemployment rate recently fell to a 48 year low of 3.7%. The shrinking pool of available workers is forcing companies to pay higher wages and benefits to attract workers, a positive for Americans after years of slow pay growth. Consumer borrowing slowed in September; with total consumer credit increasing $10.9 billion in September to a seasonally adjusted 3.95 trillion. This is an annual growth rate of 3.3%. Economists had predicted a $16.5 billion gain. Credit rose a revise $22.9 billion in August, up from the prior estimate of $20.1 billion; for the highest level since last November. Revolving credit including credit cards, slip[ped 0.4% rate in September, the fifth decline out of the past eight months. Nonrevolving credit typically automotive and student loans, rose at a 4.7% rate in September. This is down from an average annual growth rate of 8.03% in 2012. Consumer borrowing has been steadily increasing higher. Total borrowing was $2.72 billion in September 2011. But the rate of growth in borrowing has been slowing over the past year because of the tight labor market that is attracting more potential students so demand for student loans is falling. The number of Americans collecting unemployment benefits fell to the lowest level since the summer of 1973, reinforcing a downward trend in layoffs that is likely to continue to set even lower levels in the months ahead. Continuing claims fell by 8,000 to 1.62 million at the end of October, marking the lowest level since July 28, 1973. These claims reflect people who recently lost their jobs and are already receiving benefits. The number of people who applied to receive benefits fell slightly in early November to remaining near the lowest level in decades. Initial claims is a rough way to measure layoffs; they dipped 1,000 to 214,000 in the week ending in November 3rd. The level of layoffs in the US has been falling for years amid a sustained surge in hiring that has helped to pull the unemployment rate down t to a 48 year low of 3.7%. 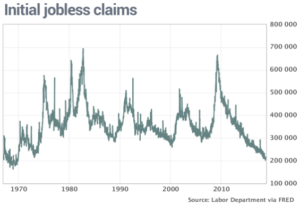 Initial claims have been below 220,000 for four and a half months, a remarkably long stretch of extremely low layoffs. The strongest labor market in decades is powering the US economy that is likely to set a record for the highest expansion ever by next year. The shrinking pool of available labor is also forcing companies to pay higher wages and benefits to attract workers, a good thing for Americans after years of slow pay growth. The Federal Reserve held interest rates steady while signaling that it will stay the course and move rates up at a gradual pace in coming months. As expected, the Fed kept its benchmark target for rates unchanged in a 2% to 2.25% range. With jobs gains “strong” and economic activity “rising at a strong rate” the committee expects further gradual increases in the target rand the federal funds rate. The statement put out by the FOMC said the risks to the economic outlook “appear roughly balanced.” Inflation was reported to be remaining near its 2% target rate. The only tweak was to note that the growth of business investment had moderated in the third quarter. Investors predict a rough 80% chance of a December quarter point rate hike. The market is taking its cue from the September “dot plot” which showed a strong majority of Fed officials forecasting the fed funds rate would be a quarter point higher by the end of this year. The Fed has already moved rates up by a quarter-point three times this year. The lack of any shift in tone of the policy statement suggests the Fed is still penciling in three rate hike for 2019. US wholesale inflation in October posted the biggest increase in 6 years, driven by higher gas prices and rising costs for some goods. The producer price index jumped 0.6% last month after barely any change since July. The increase exceeded the 0.2% forecasted by economists. If some of the goods whos prices are especially up and down are stripped out, the increase in wholesale prices was more modest. The core PPI excluding food, energy and trade margin rose 0.2%. There was little change in the direction of wholesale inflation. Producer prices rose 2.9% I the 12 months ending in October from 2.6% I the prior month. But it was still markedly lower than the seven year high of 3.3% reached only four months ago. The cost of services surged 0.7% last month. One of the biggest increases was in margins for wholesalers and retailers, a notoriously volatile category often unreliable as an inflation measure. What is notable in the October report was the increase in wholesale cost of machinery, equipment, parts, and other industrial supplies that companies rely on, perhaps a sign that both strong demand and US tariffs on products such as steel are raising costs for business. The cost of wholesale goods, meanwhile climbed 0.6% three fifths of which was tied to the higher oil prices. Yet the cost of oil has receded lately, suggesting these prices will soon ease. Inflation is higher than it was a year or two ago, but price pressures appear to have paused lately. Although wholesale prices are running close to a 3% annual pace, other inflation measures that better reflect what households and businesses pay have leveled off around 2%. That is precisely where the Federal Reserve would ideally like them to stay. A growing number of economists, however, think overall inflation will creep above 2% in the next year owing to strong US growth, a super tight labor market that is pushing up wages and the effect of tariffs. The Fed is steadily raising US interest rates to keep inflation from getting out of hand, but the central bank wants to move at a gradual pace so long as inflation remains stable. Americans are still upbeat about the economy heading into the holiday shopping season despite the big ups and downs in the stock market and rising US interest rates. The University of Michigan’s consumer sentiment index fell to 98.3 in November from 98.6 in October, according to the preliminary reading. Still the index has averaged 98.4 through the first months of the year, for the highest level since 2000. Americans think the strong economy will continue to produce more new jobs and improved incomes, but they also expect higher rates and inflation to come along with it. Younger people are hopeful that wages and incomes will continue to rise, though older Americans worry about an erosion in their standard of living due to higher inflation. However, the elderly would benefit also from better returns on their savings because of the higher interest rates. 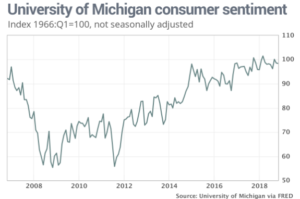 The consumer sentiment survey is the latest in a batch of reports that suggest the economy will end 2018 on a high note. The economy could grow 3% this year for the first time since 2005, propelled by higher consumer spending increased business investment and more government spending.